Living in a world with rapidly changing technology, we have to be on our toes to keep up. One way to stay ahead and plan for the future is to GO GREEN. Even the Sign and Identification industries are making changes to be more Earth Friendly. Frontrunner Signs has added a few new products that are creating less of an impact on our environment. Check them out! 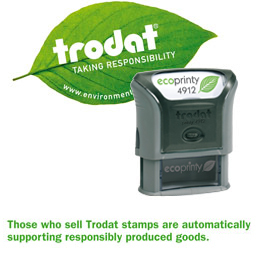 We now offer a new version of the classic Trodat Printy, it's environmentally responsible brother, the EcoPrinty! The Ecoprinty is made of 75% post-consumer material, was developed to meet the growing demand for recycled products. Frontrunner is also currently testing natural rubbers for laser engraving the dies of our stamps. This combination could make the EcoPrinty a true eco-solution in helping to clean up or reduce waste in the environment. Trodat is a great example of what being Green Friendly truly means. Click here for more information about Trodat's efforts to be nicer to Planet Earth. To order one of these 'green' little critters email us now! What do Bamboo and Sunflowers have in common? They are both being used as plaques and awards!! Frontrunner Signs is now offering plaques made from bamboo and sunflower seed hulls. Growing between 12"-18" a day in peak growing seasons, bamboo is an excellent renewable resource. A byproduct of growing and eating sunflowers is the hull. Both of these products have been used to create wonderful plaques or award base plates. We are also looking into additional gift items from renewable resources. Check out our Green Award Products here (1.65mb pdf), and/or contact us for pricing! Herculite® has recently unveiled a new line of digital print media that is biodegradable and landfill compostable. The BANTEX-TERRA™ line includes a 13oz two sided smooth banner material that is excellent for banners, POP displays, and other print applications. This banner material is landfill compostable in 1-5 years and can be recycled when properly processed. This is Herculite's press release about BANTEX-TERRA. Read on, or contact us here. ( York, PA), Herculite Inc., announced the introduction of BANTEX-TERRA™ an innovative line of biodegradable and landfill compostable digital print media for banners, POP, digital print, screen print and other print applications. This breakthrough technology enables BANTEX-TERRA™ brand products to deliver exceptional image quality, printability & performance during their expected service life with the added benefit of biodegradability. BANTEX-TERRA™ is the only flame retardant, 13oz, 2-sided, completely black-out digital media made with Herculite’s proprietary "Enhanced Micro-Texture" to insure superb image quality. The BANTEX-TERRA™ products are engineered using components tested in accordance with relevant ASTM, ISO and other standards with regard to biodegradation. BANTEX-TERRA™ biodegradable laminates are scientifically unlike any product on the market today, contain no toxic materials and are patent pending. The BANTEX-TERRA™ line also includes high performance recyclable fabrics including: BANTEX-TERRA™ Premium Flag and BANTEX-TERRA™ Universal. A Company spokesperson said, "In keeping with our reputation as a leading provider of innovative products and services, the BANTEX-TERRA™ line of products are being introduced to serve emerging interests for a more environmentally friendly solution." Herculite’s BANTEX® and the BANTEX-TERRA™ family of digital print media are the premier brands of media for digital print applications including UV, solvent, eco-solvent, water-based, screen print and dye-sublimation applications. BANTEX-TERRA™ brand biodegradable and landfill compostable laminates, and recyclable fabrics are available exclusively through Authorized BANTEX® Distributors. Email us or call us 434-293-7446 today! Copyright Frontrunner Sign Studios 2015. All rights reserved.